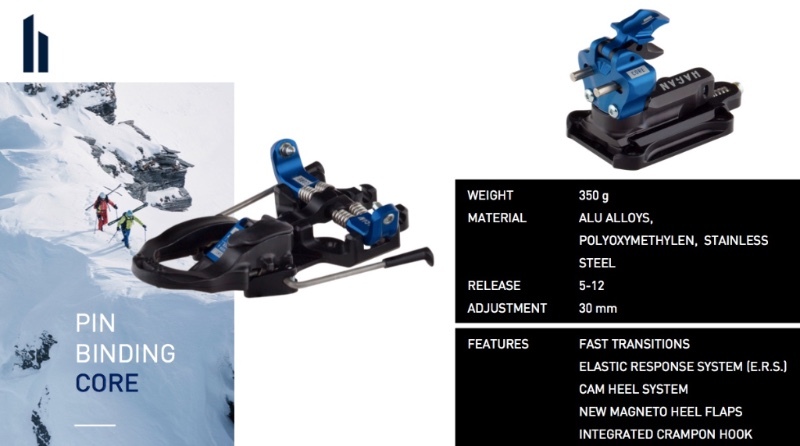 Announcing the Hagan Core freeride ski touring binding! The Hagan Core binding is an entirely new binding from Hagan, designed in conjunction with ATK and a significant improvement on the ATK Raider 12. The Hagan Core is a high performance Freeride and All Mountain touring binding. While specifically designed with our Core series skis in mind (with colors that match beautifully), the Core will also work superbly with our Boost freeride skis and Ride tour classic skis. That describes the perfect binding for the latest generation of ski tourers — the Hagan Core. If you want the best lightweight free tour set up in the world, you have to go with the Hagan Core. The revolutionary Core binding improves on standard tech bindings for a better skiing, more efficient, and hassle-free backcountry binding. The Core combines several ingenuous performance innovations: an extremely solid boot/ski connection, no torsional movement, precise release and great descending feel. Improving on the proven performance of tech bindings takes knowledge of what works and what doesn't. The Core has wide toe and heel mounts that more effectively transfer power to the edges of wide, freeride skis. A new patented E.R.S. ® (Elastic Response System) system absorbs energy resulting in consistent release values while allowing the ski to flex naturally under compression for improved downhill performance. The heel pivots rotationally to provide consistent release and retention. The patented CAM heel system adjusts to impact forces, providing far better control and skiing precision. Touring bindings spend the majority of their time going up, and the Core’s refined Magneto ® heel climbing aids are easily flippable with pole or hand for five (five!!) climbing positions. Two climbing positions can be selected without any need to twist the heel piece, making for far safer adjustments in precarious situations. At only 350 grams, the Core is the lightest high-performance free ride touring binding in the world! The Core toe is designed for much easier step-in, even with older and worn boots. The heel piece can be turned in any direction. The ski brake is toe mounted. Not only is it incredibly easy to operate, the front mount brakes are the only system in the world that engages any time the boot is released (uphill and downhill mode), so unlike other bindings, you don't have to worry about losing a ski when the binding is in walk mode. (Ever drop a ski while putting on skins, anyone?) The brake arms are extra long with wide hooks to stop your skis quickly when they go airborne without you. Integrated crampon hooks allow stress-free ascents up bulletproof snow or in no-fall zones. All adjustments on the binding can be made with a standard Phillips screwdriver, so you can leave a few extra tools out of your pack. Psych yourself up to rip the biggest, baddest, remotest lines you can find with the Hagan Core binding. MAGNETO® HEEL FLAPS : this system provide 5 different walking position, selectable with the pole tip. ELASTIC RESPONSE SYSTEM®: this system absorbs energy during ski compressions and releases it during the ski extension, allowing your skis to work the way they were designed while creating consistent retention and release. CAM HEEL SYSTEM®: controls the hooking pins stabilization, offering extreme skiing precision. INTEGRATED CRAMPONS HOOK®: integrated into the base of the toe piece for extreme rigidity and lightness!! INTEGRATED FRONT-BRAKE SYSTEM®: the only ski touring brake that is active in both uphill and downhill mode. The Hagan Core binding is available in brake widths of 86, 97 and 108mm. The Freeride Spacer accessory is also available. The Hagan Core is so new I haven't put it on the store yet, but will soon. It is available in VERY limited quantities now at Cripple Creek Backcountry and Skimo.co. Act fast if you want it this spring. The Hagan Core will be available nationally this fall. Spring is the best time for ski touring – corn snow, sunshine and warm temps. The 5 Peaks and Imperial Challenge - Sponsored by Hagan! Hagan Ski USA is proud to sponsor two iconic, local (to us) races – the 5 Peaks and the Imperial Challenge. Sign up, see us at the races, and maybe win a set of Hagan Skis. Alpine Touring, Ski Touring, Randonee, Backcountry Skiing, Ski Mountaineering, Skimo. What should we call this sport we love so much?